Old map by ANONYMOUS. -Page from a psalter. Title: Page from a psalter. Size: 3.7 x 2.8 inches. Condition: The leaf is in good original condition, The top border is slightly cropped, the leaf is clean and clear. The painting 43 x 40 mm. Leaf from a 13th century Flemish psalter, on vellum, 12 lines of text in latin, written in black ink. 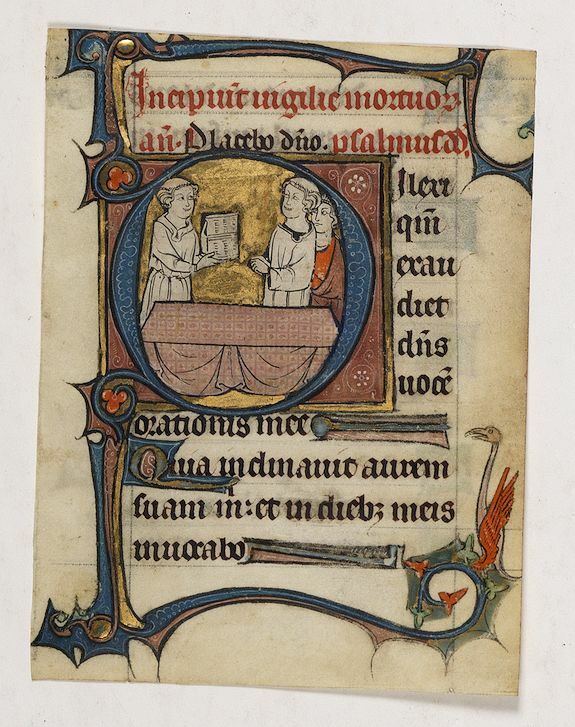 ON RECTO: Beautiful large historiated miniature of a mourning service, two monks singing at a lectern. A coffin (showing the front)on a cloth covered bier, and a mourner behind them. The miniature, six lines high, painted within a capital "D"ilexi qui'exaudiet d'ns.............". The painting 43 x 40 mm. in colours, and sharply outlined in black lines on a heavy burnished gold background. All four borders are illuminated in the typical Flemish style of ca. 1300, in heavy colours and burnished gold. A large long necked bird in the bottom right of the border. ON VERSO:12b lines of text with 5 gold capitals and 2 line fillers, as on recto.